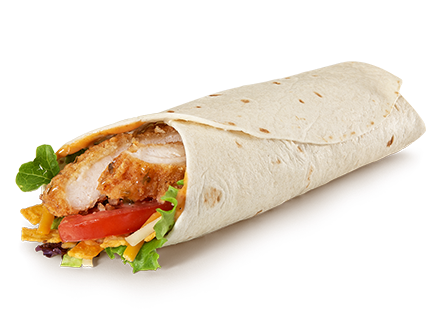 McDonald's has introduced a limited-time addition to its line of Premium McWraps: the new Southwest Chicken McWrap. I picked one up, and here is my review. This is a relatively-healthier entrée, but still contains 680 calories, 41% of the suggested daily intake of saturated fat, and 1470 milligrams of sodium. The Southwest Chicken McWrap features grilled or crispy chicken breast with a cilantro-lime glaze, crunchy tortilla strips, fresh spring greens, 2 half slices of tomato, shredded cheddar jack cheese, and a spicy, creamy habanero ranch sauce, all wrapped in a warm, soft tortilla.